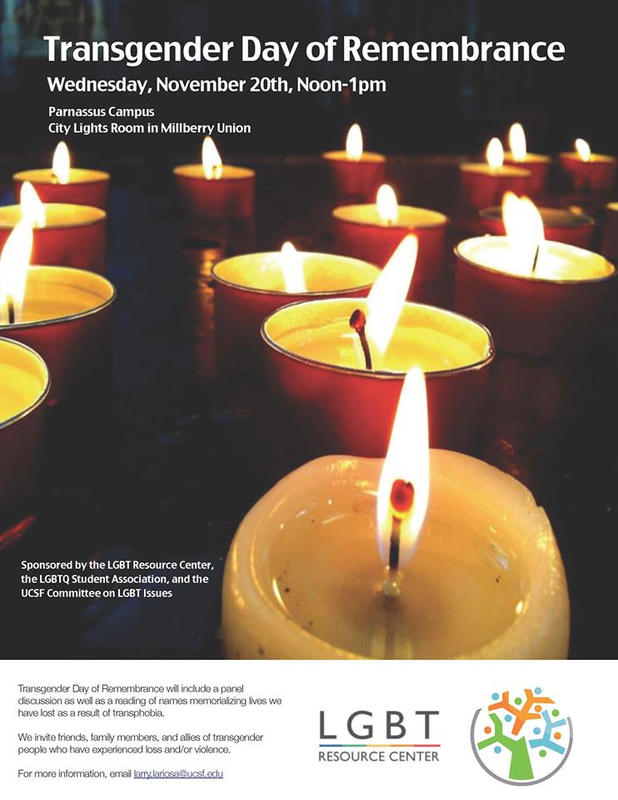 The UCSF LGBT Resource Center invites the community to a Day of Remembrance for those lost due to transphobia and violence. Nov. 20 marks International Transgender Day of Remembrance, an annual event designed to memorialize lost loved ones and raise public awareness of hate crimes against transgender people. UCSF will be participating in the memorial with a community panel and a reading of names of people lost this year. The event will be held at the Parnassus campus in the City Lights Room in Millberry Union from 12 to 1 p.m. If you would like to have a name included in the reading contact [email protected] by Wednesday, Nov. 20, at 10 a.m.
For those who would like to participate but are unable to attend, Transgender Day of Remembrance stickers will be available at various locations to acknowledge this day.